If you’re looking to visit one of the most rapidly expanding modern cities in the world, Dubai is the perfect destination. This commercial hub has exploded into a fast-paced and spectacular city in recent years, and is most certainly one of the ‘it’ destinations of 2014. The bustling inner city of Dubai is home to fantastic shopping and extravagant malls. The shops are open late, so it’s easy to get a few hours in after a day of adventures. Choose from well-known malls such as Mall of the Emirates and Deira City Centre, or the world’s largest shopping mall, the Dubai Mall. At the Dubai Mall, you’ll find over 1,200 shops, an aquarium and underwater zoo with over 33 million species of animals on show, an ice skating rink, theatre, dinosaur exhibit, and gorgeous outdoor water fountain that shoots displays of water up to 150 metres in the air. The mall is so expansive, you’ll almost certainly need more than one day to get through it all. 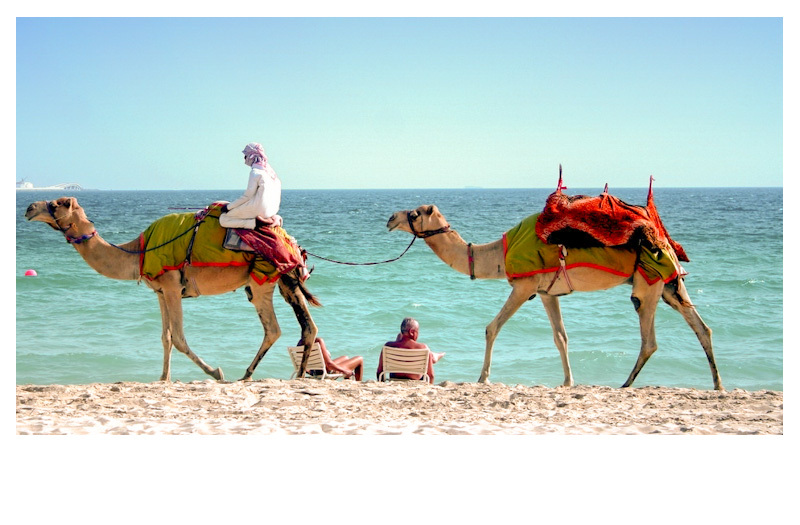 Camel riding could be one of the most authentically ‘Dubai’ attractions. These gentle giants are a fantastic way to explore the sand dunes, and was how the ancient Bedouins travelled in old times. Saddle up and admire the vast expanse of golden, rippling sands from the back of a camel, and enjoy the soft orange glow cast upon the desert landscape. Heading to the top of the Burj Khalifa building is as high as you’ll ever get without wings. The Burj Khalifa is the tallest building in the entire world, and stands at a towering 828 metres, or 160 storeys, above the ground. The building boasts the highest outdoor observation deck in the world on the 124th floor. From that height, visitors experience the most breathtaking views of the Dubai cityscape and surrounds. Head to the observation deck as the sun begins to set, and watch the blue skies fade into a glittering spread of city lights. Adding to Dubai’s list of ‘world’s largest’ attractions, is Gold Souk, the largest gold market in the world. This gold market is packed to the brim with stunning treasures and jewellery, including diamonds, emeralds, rubies, sapphires, and of course – gold. It’s said that there’s up to 10 tonnes of gold at the market at any one time, and strict government restrictions mean you can count on its authenticity. Roam the sparkling array of shops and displays and don’t be afraid to haggle a price if you spot a piece you love!